While this blog focuses on whiskies that I find lovely, sometimes I taste a whisky that disappoints. One such example is the Dalmore 12 Year Old. This particular batch of Damore 12 Year Old has caramel added to enhance its colour. You can see if caramel is added by looking at the ingredients or, in the case of this bottle, the back of the bottle on which it reads in Danish “farven justeret med karamel”. That translates to mean “colour adjusted with caramel”. 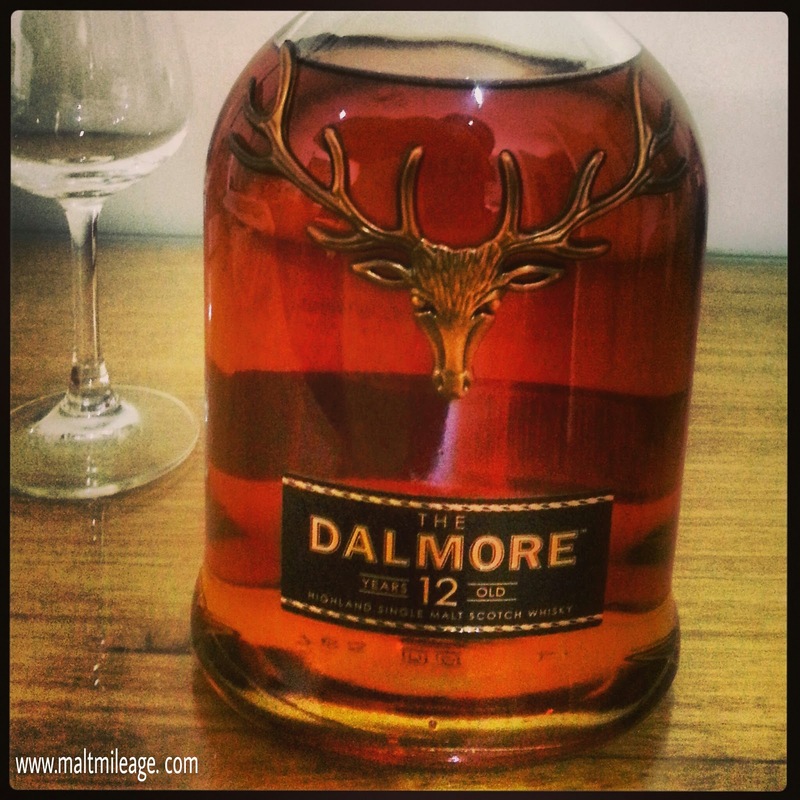 I really like the bottle and the story behind the Dalmore, which includes a claim that an ancestor of the owners (the MacKenzie family) saved the life of King Alexander III in 1263 by protecting him from a rampaging stag. In return, the king let the person (and his descendants, the lucky folks!) use the symbol of a 12 point stag (a Royal emblem) in the family coat of arms. Great story… great bottle… great colour… pity about the whisky. On the nose the Dalmore 12 Year Old has the foundation of a new spirit, with a malty theme that permeates with that sourdough mustiness. When a whisky is first distilled, it is while and smells quite musty with some orchard fruit notes and quite malty. Time in the cask should iron out the creases, but this whisky smells very young despite its 12 long years in oak. How strange. There is some sherry and sweetness; not a fresh fruity sweetness but rather the sweetness you would expect of a sweet sherry, toffee, syrup and honey. The sweet sherry hits the palate together with the flavour of a newly distilled white spirit, and then a bitterness sets in like over-burnt toffee. The texture is watery and there is not much happening on the palate. What finish? This whisky retreats quickly, without much lingering taste at all.